And now time for another post where I comment on news that either broke after I created this week’s Friday Five or there has been new developments in a story that I’ve previously written about. 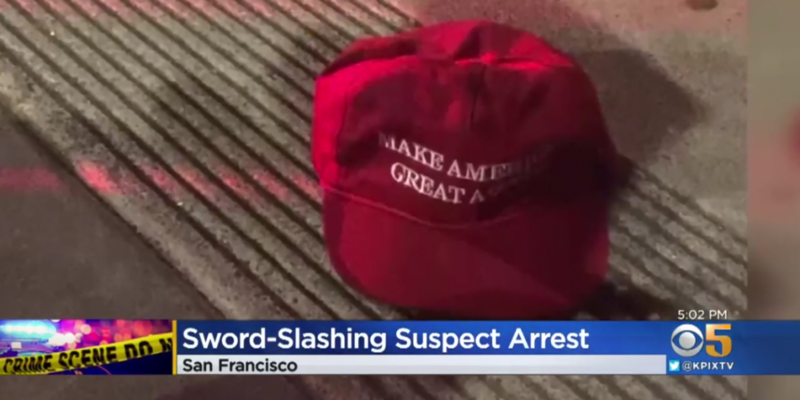 So, last week I linked to the story of a guy in a red Make American Great Again hat yelling homophobic slurs are people going into a skating rink in San Francisco who eventually allegedly attacked one of those people with a sword. There’s been an arrest: Attempted Murder Charge In SF MAGA/Sword Attack. Police found the guy because they had a fingerprint from a beer bottle left at the scene, and someone found a bloody sword wrapped in a shirt which matched the description of the alleged perpetrator’s clothes as described by some of the witnesses. And the sword a fingerprint that matched the print on the bottle. The stories I’ve read thus far don’t say whether the perpetrator’s fingerprints were already in the system, though The Blaze reports that the alleged perp was arrested for unlawful entry into a vehicle in Multnomah County, Oregon, in October 2012 and during that crime he threatened the owner of the vehicle with a knife. In any case, the guy doesn’t appear to be very bright because he got into an argument with his court-appointed defense attorney during the arraignment. I’ll get to that in a minute. We now have a lot more information on the crime. Some of the eyewitnesses at the time had mentioned a pirate costume along with the red hat, while others had described a red flannel shirt over otherwise unremarkable clothes. Apparently he was wearing the sword on his back, and some witnesses had seen that and assumed it was a costume piece, and not an actual, you know, sword. Also, while the victim wasn’t named last week, and was described as being treated for non-life-threatening injuries, the victim’s name has since been released, and the injury is described as “partially severed hand” and “gruesome.” The victim has admitted that he attempted to knock the guy’s hat off his head, and then he thought that the perpetrator knocked his arm away with an umbrella or a nightstick, and didn’t realize what had actually happened right away. I think the attorney recognizes that his client has all the evidence against him. Multiple eyewitnesses, his fingerprints at the scene and one the weapon used in the assault are just the parts we know about. The stories last week mentioned that the police were in the process of obtaining video footage from neighborhood security cameras, for instance. And I bet that were hair fibers left on the hat, and possibly on the bloody shirt that the sword was wrapped in. We presume that he discarded the shirt with the sword because there was blood on it, but looking at the photos in last week’s story of the huge splash on blood on the sidewalk, I wouldn’t be surprised that some of the other clothes the alleged perpetrator was wearing that night that he didn’t dispose of got a bit of blood on them. If the evidence against him is even worse than what we know, the defense attorney may be correct that the best defense that is available to his client is to spin for the self-defense angle. His client is being held on $1 million bail, so I don’t think he’s going to avoid a trial without a plea deal. Let’s go from a hate crime that had lots of witnesses and other evidence, to one lacking all of those things (not to mention credibility): Chicago to Sue Jussie Smollett After Deadline to Pay $130,000 Investigation Reimbursement Passes. As I mentioned in an earlier post, once we knew the details of Smollett’s report of an alleged crime it seemed very fishy. Why would Trump-supporting homophobic racists recognize an out gay actor who plays a supporting character on a prime time soap opera-type show that is all about a family of african-american musicians? They just aren’t in the same demographic as the show’s audience, right? Smollett has since been given deferred prosecution and let go, and he seems to be really leaning hard into the lie that this exonerates him of all charges that the report was a hoax. And let me be clear: deferred prosecution, particularly when the Deputy District Attorney who did so explicitly said that this doesn’t exonerate him, is neither vindication nor exoneration. I suspect that the District Attorney’s office made this call because pursuing the case wasn’t going to result in significant jail time. I also suspect that the two brothers who say they were hired by Smollett to stage the crime may not come across very good in the witness stand if it came to that. I also think that good attorneys on Smollett’s side could get a lot of mileage by talking about cases (and there have been some in Chicago) where white people have falsely reported crimes but they were never prosecuted. Not that I think Smollett should get off scott free, here, but I can see reasons that not pursuing the charges might make sense. As another story noted, during the few weeks between the time that Smollett was charged for filing a false report and the day the charges were dropped, about 2900 other criminal cases where handled by the same prosecutor’s office. The sheer volume of crime cases in the county are often cited as the reason that they have been deferring prosecutions and seeking other kinds of diversion for a lot of non-violent crimes during the last few years. At least the District Attorney’s office is supporting calls for an independent investigation into their handling of the case. Since it is also alleged that Smollett is behind the threatening letter that was mailed to the TV show before the alleged hoax attack, and since the FBI is looking into that letter, I suspect that Smollett is going to be standing in front of a judge again in the not-so-distant future. The part that I’m still most angry about is that this case is being used by folks on the right to claim that all hate crime reports are fake. It’s exactly what many, many people were posting as comments on the reports about the sword-attack I mentioned above. Even though there is a lot of evidence that that crime did happen.